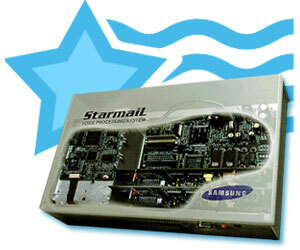 Voice Mail for DCS Compact & Prostar - Samsung's StarmaiL, designed for use with DCS Compact and Prostar telephone systems, offers the ultimate combination of simplicity and sophistication in a voice mail system. Use it to answer all incoming calls, as a backup to an operator, or simply as a voice messaging system. StarmaiL has all the necessary recordings and prompts to work right out of the box. Or you can record your greetings in your own voice. Use it to answer all incoming calls, as a back-up to an operator, or simply as a voice messaging system. StarmaiL’s fast, accurate call routing improves customer satisfaction and increases employee productivity. Callers never get a busy signal or an unanswered phone. If an extension is busy or unavailable, the caller may be redirected to a voice mailbox, another extension or the operator. And any mailbox can alert a tone or digital pager, so you won’t miss important calls. StarmaiL grows with your business. Modular expansion lets you buy only what you need now, from two to eight ports and six or twelve hours of message time. Auto attendant offers 6 menu levels and 40 branches for simple or complex call routing structures. Up to 600 voice mailboxes may be installed with individual passwords for each mailbox. StarmaiL automatically configures itself to your Samsung phone system, reducing installation errors and set-up time. Programming the system is as easy as following spoken directions or using our SIP DOS-based PC program. There are no special commands or programming languages to learn. While other manufacturers commonly use 24 and 36 Kbps (kilobits per second), StarmaiL records messages digitally at 64 Kbps to ensure exceptional clarity. The higher the number, the more "real" the recordings sound. Use your DOS-based PC to easily program even the most advanced StarmaiL features. Our SIP (StarmaiL Installation Programmer) lets you configure StarmaiL on your own PC and download the information to the system. Your installation is also saved for editing or re-installation as necessary. Connect a printer to StarmaiL and you can print system usage statistics by port and mailbox. Up to two divisions of your company can have different day and night greetings. You tell StarmaiL when to switch over to the evening greetings. If the first employee paged by the mailbox doesn’t answer, a second pager may be notified. And if they don’t answer, a third may be added. You can easily program up to three levels of digital pager notification with adjustable intervals between three levels. Alphabetical Directory – Callers who don’t know the extension number they are trying to reach can use the telephone keypad to enter the first three digits of an employee’s name. Broadcast and Group Mailboxes – Send the same message to all employees or a group of mailboxes for immediate updates or bulletins. Department Directory – Callers reaching a particular department can hear a list of all employees in the department by name and choose the person with whom they wish to be connected. Fax Recognition – Eliminate dedicated fax line charges. StarmaiL allows you to use any available phone line for your fax by detecting fax machine calls and automatically transferring them to your designated fax extension(s). Information Distribution – Supply callers with frequently requested information in the form of pre-recorded messages.